Cookie Parties are a delicious holiday tradition for many families and groups of friends. 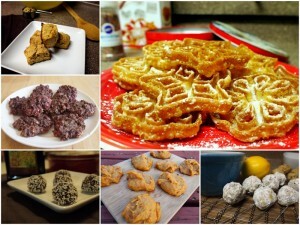 It is a great way to make a wide diversity of cookies with plenty to sample and spare. This year, why not bring vegan and gluten-free cookies to the party with some of our favorite cookie recipes? This year, I wanted to tackle some of James’ family favorites including some Italian treats like Pistachio Biscotti, Italian Wedding Cookies, and Vegan Rosettes. If you want to celebrate the holiday with some of our more unusual winter vegetable cookies try our traditionally flavored Sweet Potato Drop Cookies or vibrant Beet Cookies. Or, if something a little more All-American is what you want to bring to the party try our Oatmeal Raisin.